The natural affinity of technology service organizations towards software and technical training as the predominant solutions to their service challenges leaves them in a widening gap between customer expectations and actual service capability. And yet, due to product commoditization and the omnipresence of the internet, pressure is mounting for the service business to build customer loyalty. Therefore, today’s service functions must be efficient and effective in how they provide solutions to customer incidents and problems. This presentation will examine the factors that drive a successful service function. It will challenge the traditional "technology is the answer" paradigm by demonstrating how a more strategic, process- and people -driven approach is critical to delivering a consistent, high quality problem resolution. It will introduce a number of methodologies and approaches – centered on the concept of creating Customer-Lifetime-Value - that allow the service business to assess what drives performance and leverage its most valuable service asset – its people. 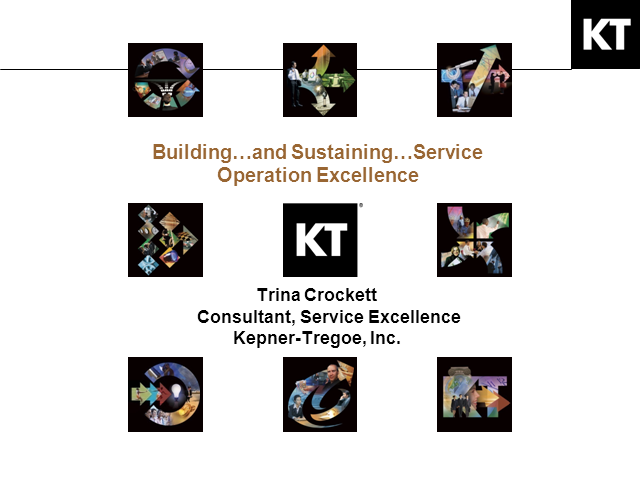 Trina Crockett, Consultant, Kepner-Tregoe, Inc. Presented by: Trina Crockett, Consultant, Kepner-Tregoe, Inc.